I like this blog post by Robert Peal entitled ‘A Myth for Teachers: Jobs That Don’t Exist Yet’. The article looks at the origins of the idea that the top 10 in-demand jobs in 2010 didn’t exist in 2004 and its later variant that 60 per cent of the jobs for children in school today have not been invented. In both cases he found it impossible to track these statement in any reliable research. Of course these are myths. But often such myths can be tracked back to quite prosaic political objectives. For a long time, the European Union has pushed the idea of the knowledge society. And whilst there are many learned papers describing in different ways what such a society might look like or why such a society will emerge there is little evidence of its supposed impact on labour markets. Most common is the disappearance of low and unskilled jobs, linked to growing skill shortages in high skilled employment. Yet in the UK most recent growth in employment has been in low skills, low paid jobs in the retail sector. I remember too in the late 1990s when the European industry lobby group for computers were preaching dire emergencies over the shortage of programmers, with almost apocalyptic predictions of what would happen with the year 200 bug if there were not major efforts to train newcomers to the industry. Of course that never happened either and predictions of skills shortages in software engineering persist despite the fact the UK government statistics show programmers pay falling in the last few years. 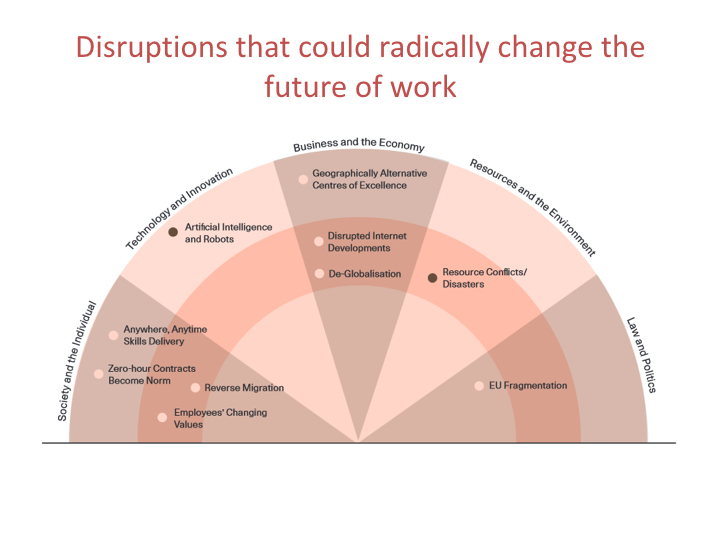 I’ve been invited to do several talks in the last year on the future of work. It is not easy. There are two lengthy reports on future skills for the UK – ‘Working Futures 2012- 2022’ and ‘The future of work: jobs and skills in 2030’, published by the UK Commission for Skills and Industry. Both are based on statistical modelling and scenario planning. As one of the reports says (I cannot remember which) “all models are wrong – it is just that some of more useful than others. Some things are relatively clear. There will be a big upturn in (mainly semi skilled) work in healthcare to deal with demographic changes in the age of the population. There will also be plenty of demand for new skilled and semi skilled workers in construction and engineering. Both are major employment sectors and replacement demand alone will result in new job openings even if they do not expand in overall numbers (many commentators seem to forget about replacement demand when looking at future employment). But then it all starts getting difficult. Chief perhaps amongst this is possible disruptions which can waylay any amount of economic modelling. 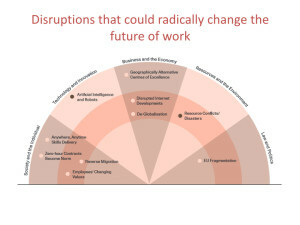 The following diagram above taken from ‘The future of work: jobs and skills in 2030’ shows possible future disruptions to the UK economy and to future jobs. One of these is the introduction of robots. With various dire reports that up to 40 per cent of jobs may disappear to robots in the next few years, I suspect we are creating another myth. Yes, robots will change patterns of employment in some industries, and web technologies enable disruptions in other areas of the economy. Yet much of the problems with such predictions lay with technological determinism – the idea that technology somehow has some life of its own and that we cannot have any says over it. At the end of the day, despite all the new technologies and the effects of globalization, there are massive policy decisions which will influence what kind of jobs there will be in the future. These include policies for education and training, inter-governmental treaties, labour market and tax policies, employment rights and so on. And such considerations should include what jobs we want to have, how they are organised, where they are and the quality of work. At the moment we seem to be involved in a race to the bottom – using the excuse of austerity – which is a conscious policy – to degrade both pay and work conditions. But it doesn’t need to be like this. Indeed, the excuses for austerity may be the biggest myth of all.